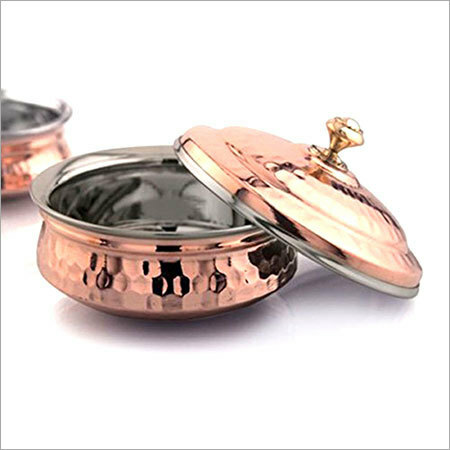 Bring that warmth to your tableware set with a set of copper steel handi with lid. This a modern outlook of serving containers traditionally made from mud. This handi is used for serving Indian food. The copper outer lining makes it safe to re-heat the food if necessary. Several dishes are names after it, such as vegetable handi, chiken handi, handi murgh masala, handi kabab, etc. These dishes are served with naan, parathas, tandoori rotis or chapatis.